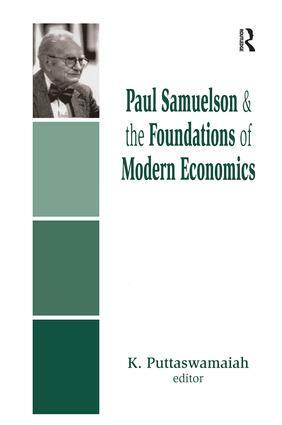 Paul A. Samuelson was the first American Nobel Laureate in economics, and the second overall. He was credited for "the scientific work through which he has developed static and dynamic economic theory and actively contributed to raising the level of analysis in economic science." That recognition is now thirty years old and Samuelson remains at work in the cutting edge of the discipline. He is also widely known for a basic textbook that became a landmark learning tool throughout the second half of the twentieth century. This excellent collegial appreciation focuses heavily on Samuelson's Foundations of Economic Analysis. In that work, and a series of brief essays, he has contributed to an integration of statics and dynamics by way of the correspondence principle. He has also combined the multiplier and accelerator mechanisms in a model of economic fluctuations; he has reformed the foundations of consumption theory by his concept of revealed preferences; he has developed or improved several major theorems within international trade; and created theories of maximum efficiency and maximum growth rate. Finally, he has clarified the role of collective goods in resource allocation. In considering the work and life of Samuelson, editor Puttaswamaiah, has assembled a worthy group of brilliant commentators. Among the analytic papers in this volume are "An essay on the Accuracy of Economic Prediction" by L.R. Klein, "Analytical Aspects of Anti-Inflation Policy" by Robert M. Solow, a paper by Vittorangelo Orati on Samuelson's linkage to Schumpeter and Keynes, "Money and Price Theory by Carlo Benetti and Jean Cartelier, and a concluding essay on "The Role of Samuelson's Economics" by Michael Emmett Brady. Most unusual in works of this kind are some strong critical statements, including a pungent examination of vanity as well as creativity in Samuelson's work. What emerges is a clear picture of a special scholar. Scholars and students will welcome it alike-a result that well fits the purpose and character of Samuelson. The festschrift has its origins in several issues of the International Journal of Applied Economics and Econometrics. Professor K. Puttaswamaiah has more than three decades of editing journals in economics. He is a member of the journal; Savings and Development issued at the University of Milan. He is author of Economic Development of Karnataka, Cost-Benefit Analysis, and Nobel Economists: Lives and Contributions. Kreislauf and Great Aggregates: The Missing Link in the Work of Processor Samuelson. Or, "In Search of Lost Dynamics".